even when the ideas are simple. Some people have trouble with math. Often, it's not because the ideas are difficult, but because they are being presented in a foreign language. This book teaches the language of math. 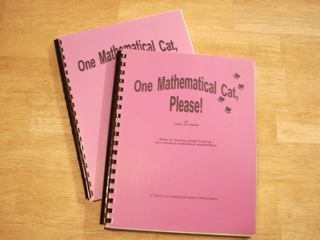 It explores ideas that are central to ALL of mathematics. You don't need any computational skill beyond arithmetic with numbers like 1, 2, and 3. Math will make more sense! Use it for any math class, from junior high school through college-level, or for self-enrichment at any age. Pretty purple cover with protective plastic, black spiral-bound, sturdy black back cover, 148 pages. Lies flat when open. WANT TO COPY IT YOURSELF? For $50 (includes media mail shipping), I will send you a clean double-sided copy, with the rights to make as many copies as you need for educational purposes. You cannot make a profit: if sold, the cost must only reimburse production costs. Media mail takes about 8 to 10 days. For Priority mail, please add $5.00 to the prices given.